I may spend my nights dreaming about old bottles of wine but I typically spend the evenings before drinking young wines. Most recently I have focused in on Italian wines. What can I write but that the group featured in today’s post is thoroughly enjoyable with a few wines exciting. 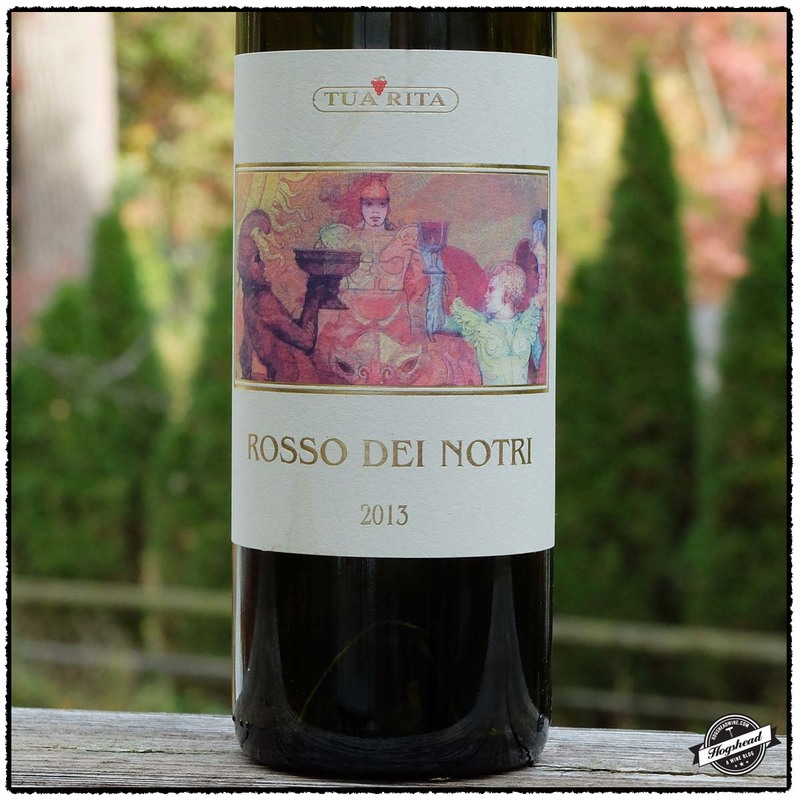 The most approachable wines are the 2006 Castello D’Alboa, Chianti Classico Riserva and the 2013 Tua Rita, Rosso Dei Notri, Tuscany. This is a contrasting pair for the former is a traditional, restrained Chianti and the later is a forward, almost-strapping Super Tuscan. Straddling the line between a current drinker and one for the cellar is the 2007 D’Angelo, Caselle, Aglianico del Vulture. It exhibits an attractive mix of savory flavors, minerals, and spices. 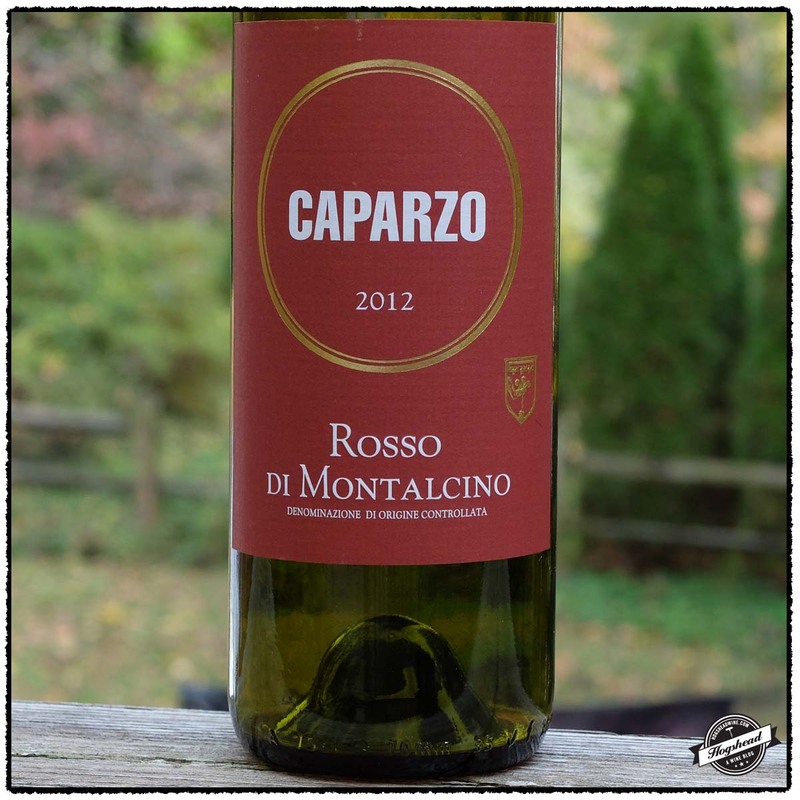 Two Rosso di Montalcino priced around $20 per bottle deserve a place in your wine rack. 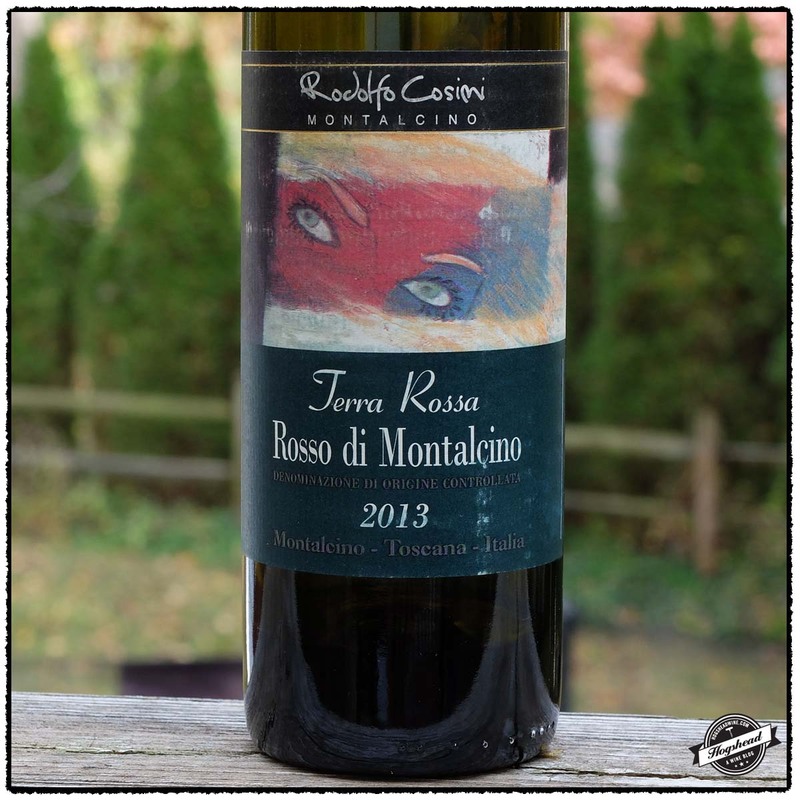 The 2012 Caparzo, Rosso di Montalcino and the 2013 Rodolfo Cosini, Terra Rossa, Rosso di Montalcino. 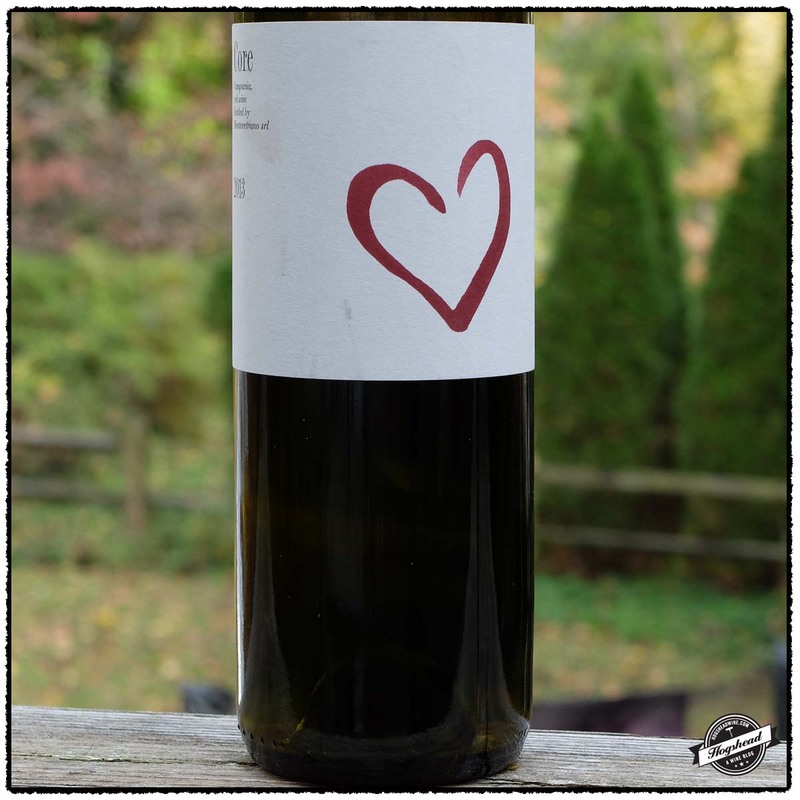 Worthy of slumbering in your cellar is the 2013 Montevetrano, Core, Campania. Though completely shut down on the first night, this wine eventually releases complex aromas and minerally, black fruit in the mouth. These wines are available at MacArthur Beverages. Imported by Zonin. Alcohol 13%. The slightly meaty aromas of red fruit revealed a shy hint of maturity. In the mouth the blacker fruit firmed up with air. This traditional wine has a gentle flavor, watering acidity, and a firm existence. It is less ripe, instead the cherry flavors match the tannins that take hold of the inside of the gums. This will never be lush, instead always lithe. *** Now – 2023. Imported by Grappoli Imports. Alcohol 13%. The savory, weighty start brought forth blacker fruits that build up levels of spices and minerals until lipsticky, red fruit came out. The cool seamless acidity is matched by drying tannins from the start, wrapping up with citric notes on the gums. Strong potential here. ***(*) Now -2025. Imported by Vineyard Brands. This wine is 100% Sangiovese aged for 1 year in Slavonian oak casks. Alcohol 13.5%. The deep, fruity aromas on the nose are followed by the young and strong flavors in the mouth. The fruit is surrounded by ripe tannins, at first showing more forward black fruit and minerals but with air the wine becomes more structured. It clearly shows dark potential with both integrated acidity and tannins. Strong potential. *** Now – 2015. Imported by Winebow. This wine is 100% Anglianico that was fermented in stainless steel then aged for 10 months in oak barriques. Alcohol 13.5%. After much air the nose oscillates between leather and earthy aromas to a little sweaty, complex bitters aromas. In the mouth the young wine eventually released minerally, black fruit, dry structure, and an engaging mix of liquor and wood in the finish. Will be quite good but needs time to show its best. ***(*) 2018-2028. Imported by Enotec. This wine is 100% Sangiovese that spent one year in medium oak barrels. Alcohol 13.5%. There were hints of leather on the nose followed by riper, more extracted flavors in the mouth. More potent in the mouth there are hints of cream and polished wood. Overall this exhibits more minerality than fruit. *** Now – 2025. Imported by Winebow. This wine is a blend of 50% Sangiovese, 30% Merlot, and 20% Cabernet Sauvignon that was aged for three months in both stainless steel tanks and barriques. Alcohol 14%. There are good, fruity flavors of licorice and a bit of red fruit supported by black fruit. The ripe flavors are moderated by puckering acidity on the tongue tip that morphs into a hind of modern, creamy, roundness in the finish. The drier finish brings out baking spices, and a camphor-like aftertaste. Overall, this wine has a youthful fruit profile with enough concentration to develop for a few years. *** Now – 2022. I love perusing The Proceedings of the Old Bailey for content in anyway related to wine. This site may sound familiar due to my Murder and Thieves series of posts. Inspired by Sharon Howard’s investigation of phrases in the criminal proceedings, I present to you extracts from twelve different proceedings spanning the years 1683 – 1737. This is by no means a thorough list, just one the presents a variety of events involving a Bottle of wine. I strongly encourage you to read more of these proceedings for in the last case you will find, ” When the Wine came up, they fill’d a Glass, which I believe was a full Pint-glass, and with bitter Oaths and Imprecations, they forced me to drink it off”. 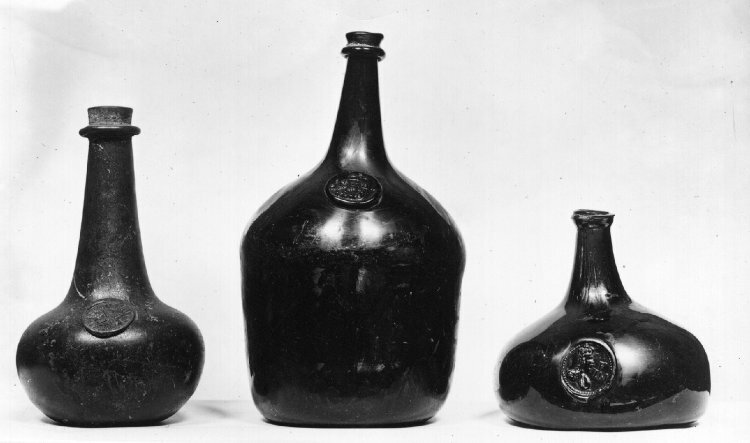 17th century English wine bottles. The British Museum. Old Bailey Proceedings Online (www.oldbaileyonline.org, version 7.2, 27 October 2015), August 1683, trial of Frances Marsh (t16830829-2). Old Bailey Proceedings Online (www.oldbaileyonline.org, version 7.2, 27 October 2015), April 1684, trial of Lawrence Axtel Elizabeth Axtel (t16840409-25). Old Bailey Proceedings Online (www.oldbaileyonline.org, version 7.2, 27 October 2015), September 1684, trial of George Caskey Francis Pevanson, alias Peverson Daniel Ballantine (t16840903-18). Old Bailey Proceedings Online (www.oldbaileyonline.org, version 7.2, 27 October 2015), October 1685, trial of William Lacy (t16851014-4). Old Bailey Proceedings Online (www.oldbaileyonline.org, version 7.2, 27 October 2015), January 1686, trial of Edward Reyon (t16860114-13). Old Bailey Proceedings Online (www.oldbaileyonline.org, version 7.2, 27 October 2015), December 1688, trial of Jane King (t16881205-22). Old Bailey Proceedings Online (www.oldbaileyonline.org, version 7.2, 27 October 2015), June 1714, trial of Eleanor Collins (t17140630-53). Old Bailey Proceedings Online (www.oldbaileyonline.org, version 7.2, 27 October 2015), December 1720, trial of Edward Ely (t17201207-37). Old Bailey Proceedings Online (www.oldbaileyonline.org, version 7.2, 27 October 2015), December 1728, trial of Thomas Otway (t17281204-13). Old Bailey Proceedings Online (www.oldbaileyonline.org, version 7.2, 27 October 2015), August 1730, trial of David Murphey (t17300828-30). Old Bailey Proceedings Online (www.oldbaileyonline.org, version 7.2, 27 October 2015), December 1734, trial of Martha Holcomb , alias Nichols Charles Holcomb (t17341204-28). Old Bailey Proceedings Online (www.oldbaileyonline.org, version 7.2, 27 October 2015), October 1737, trial of Thomas Car Elizabeth Adams (t17371012-3). The 1811 vintage in Madeira was harvested during the second occupation of the island by the British during the Napoleonic wars. The War of 1812, between the Great Britain and America, meant that regular supplies of Madeira to America were soon disrupted. While the 1811 vintage may not have arrived in a timely manner, it eventually did, making the wine lists of Delmonico’s and Aster House as an example. 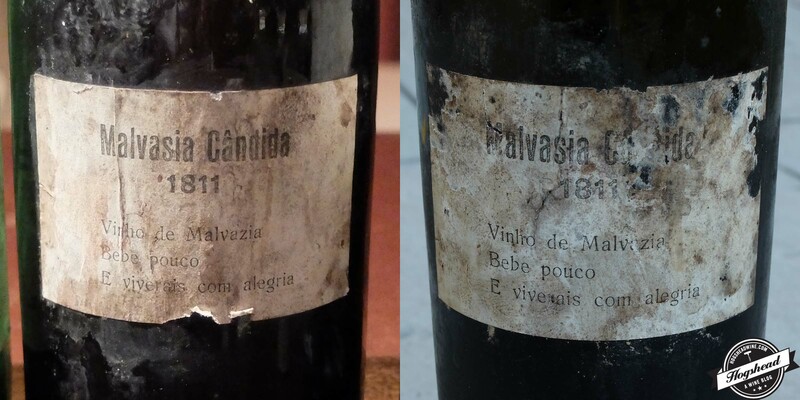 For the last several years bottles of Madeira labeled “1811 Malvasia Candida” have reached both American and English shores, some of which have appeared at auction. All of these wines bear the same label and until recently, were only found in Burgundy-shaped bottles sealed with a rust-red wax seal. It appears that perhaps a year ago, a new variant appeared in a Bordeaux-shaped bottle sealed with dark gray wax. This year I have had the opportunity to taste both bottlings of this 1811 Malvasia Candida, first in New York City and second in Washington, DC. NYC bottle on left. DC bottle on right. It was on April 11, 2015, at The Majesty of Malvasia Tasting in New York City that I first tried this wine. This particular bottle came from a private island source. 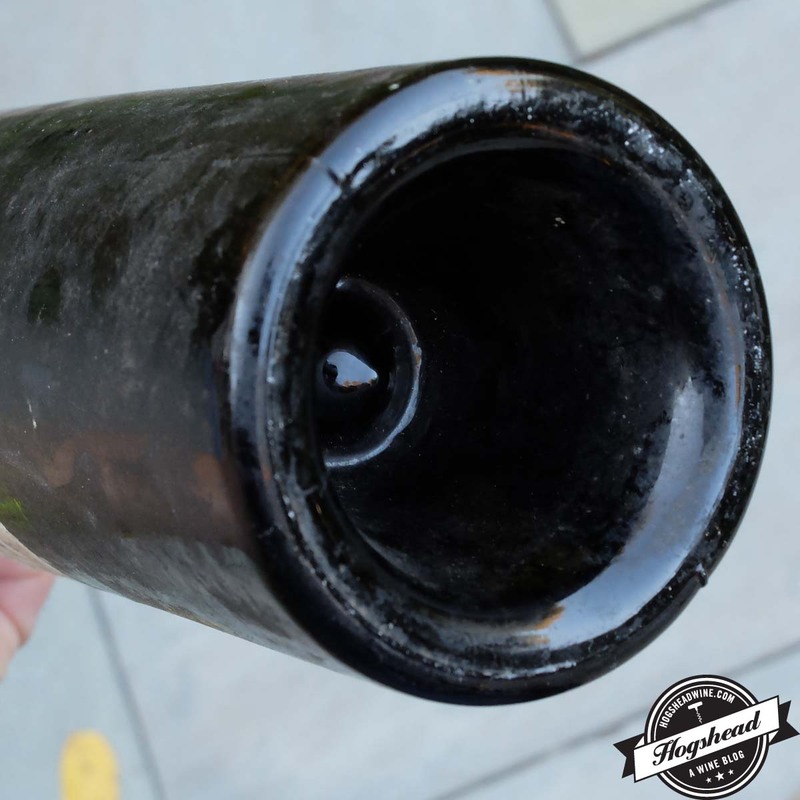 This bottle itself was in “an old Burgundy or Champagne style bottle with a rust-colored wax capsule”. It is possible that the capsule bore an impression “from a JNV Seal”. The bottle was stoppered with a “[r]elatively long cork”. Alex Liddell does not describe the bottle shape nor the color of the wax. His bottle was labelled and stenciled whereas ours was only labelled “1811 Malvasia Candida” followed by “Vinho de Malvazia / Bebe pouco / E viverais com alegria”. Richard Mayson, in his post The Majesty of Malvasia, translates the label as, “Malvazia Wine / Drink a little / And you will live with happiness”. This seems to be a mix of Portuguese proverbs. Both Alex Liddell’s and the New York City bottles had relatively long corks. 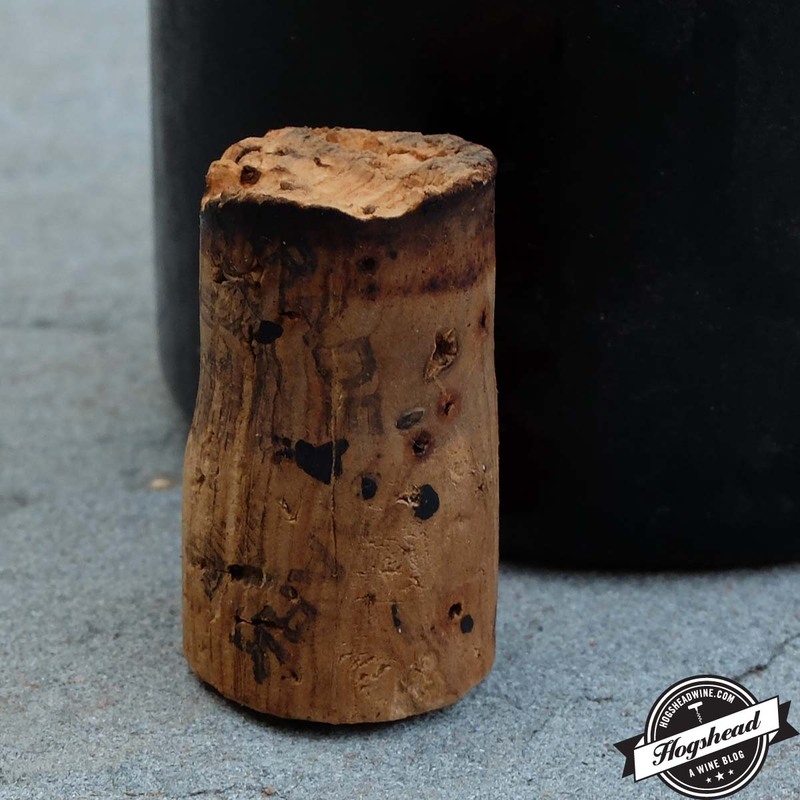 The Washington, DC, bottle had a very short, 1-3/8″ in length, tapered cork which is still soft and springy to this very day. The cork is branded with “TRADEMARK” at top, a castle tower like image in the middle, and “MADEIRA” at the bottom. 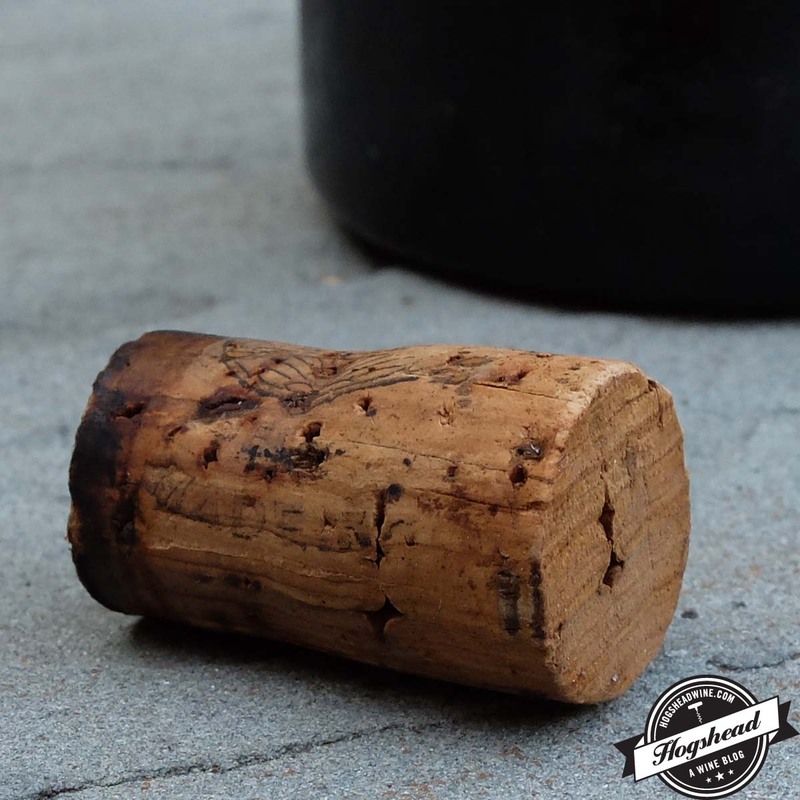 The cork is only stained at the narrow end from the wax. The cork still smells like sweet old wood and vintage Port. The Washington, DC, bottle is listed as lot #943 for the May 21, 2015, Acker Merrall & Condit Auction from which it was purchased. It appears in a grouping of six bottles divided into four lots which is pictured on page 215 of the auction catalog. The wax capsule appears exactly the same as lot #941 1842 H. M. Borges Terrantez and potentially the same as lot #942 1715 H. M. Borges Terrantez. You may view the catalog here. At Zachy’s Spring Auction on May 9, 2014, appears lot #821, a bottle of “Madeira Malvasia Camica 1811” that had “very top shoulder” fill. I have not seen a picture of this bottle but I suspect “Camica” is actually “Candida” and that the fill implies a Bordeaux-shaped bottle. On Pinterest, you may find images of the Burgundy shape bottled here and the Bordeaux-shaped bottle here. Whether the Christie’s bottle looks like our Washington, DC, bottle is not yet known but the description sounds similar. I would be curious to learn if the Washington, DC, bottle ultimately came from the O.P. Brothers Collection. The Washington, DC bottle was decanted the night before and arrived at our dinner table in a decanter. One sniff of my glass revealed, youthful, ripe fruit that immediately told me this was a different wine than what I tried in New York City. Indeed, in the mouth the wine was ripe, sweet, youthful, and contained a pure thyme note. In short, it was enjoyable. Here is my tasting note. [Washington, DC. Three-part molded Bordeaux bottle, dark green glass, sealed with dark gray wax. Heavy sediment on bottle. 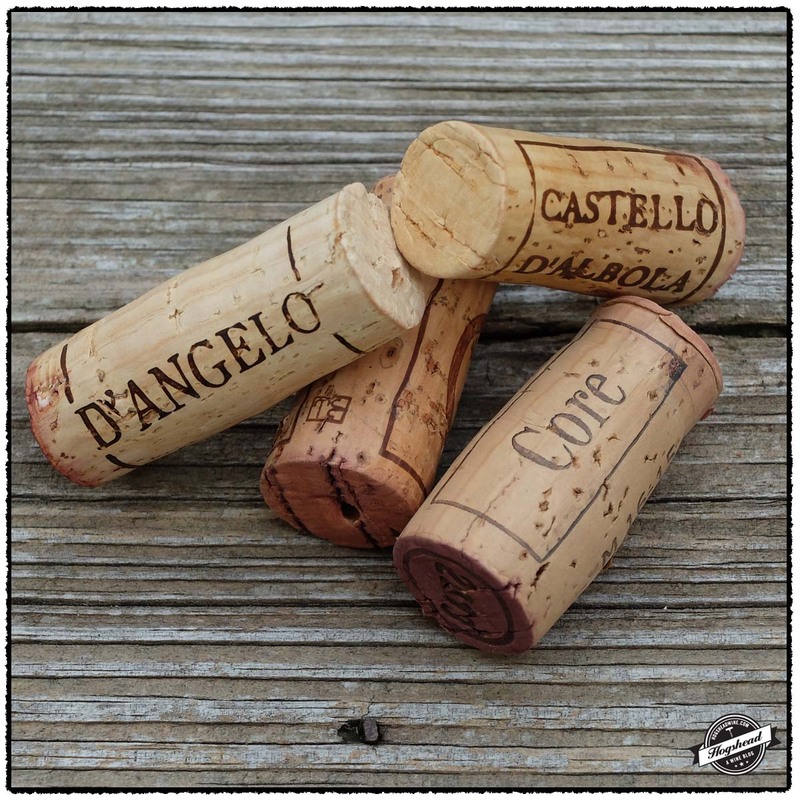 Very short tapered cork.] Acquired from a private collection Acker Merrall & Condit auction May 21st, 2015, New York. This was very sweet on the nose and with air, a prominent thyme note came out. In the mouth this wine was sweet, concentrated, vibrant, with a hint of Big Red flavors and a bit of greenhouse. There was sweet sugar and lots of thyme flavors. Way too young to be an 1811 and of the wrong flavor profile. Nevertheless, whatever was in the bottle, provided a tasty experience. Not Rated. 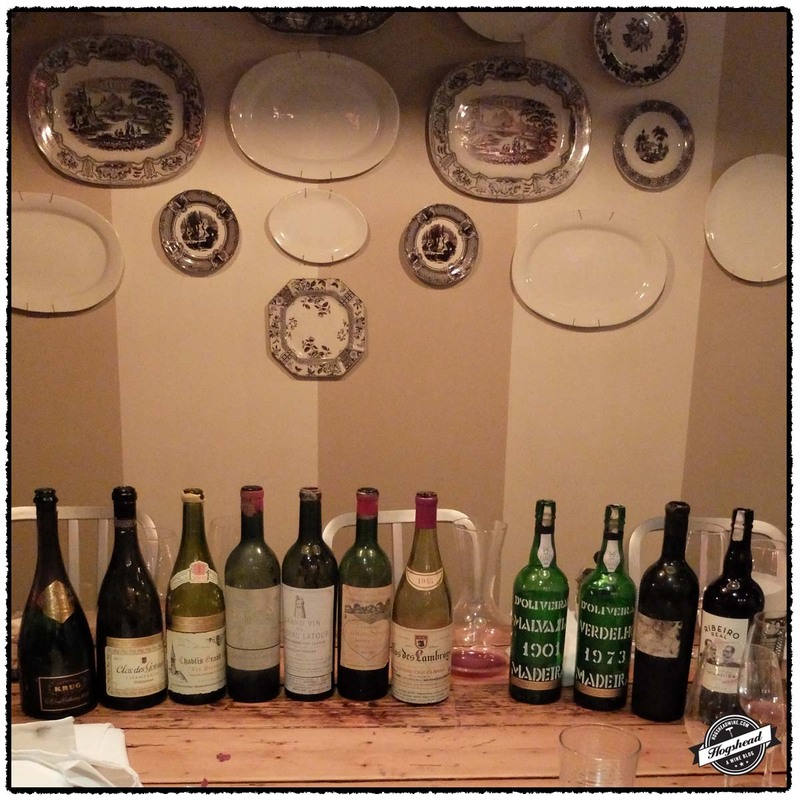 The night before our Washington, DC, dinner I tasted bottles of 1867 and 1833 Barbeito Bual that had been imported by Mannie Berk (Rare Wine Co.) from Ricardo Freitas (Vinhos Barbeito). Thus they bore perfect provenance. 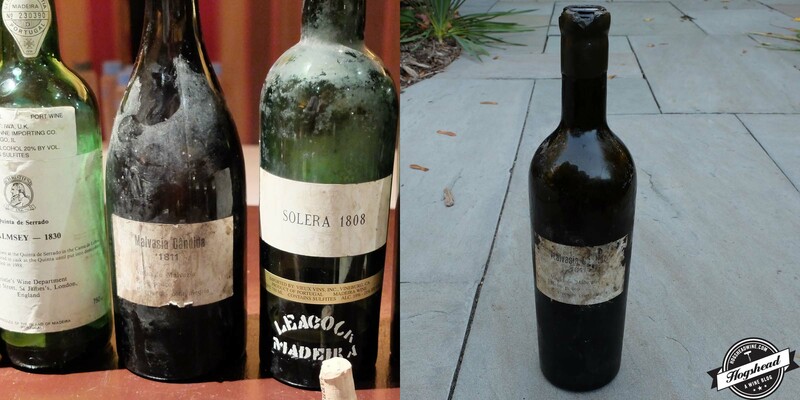 Incredibly, the 1811 tasted decades younger than the recently bottled 1867 and 1833! I can appreciate the need for a new cork, new wax, and perhaps some topping off. But the Washington, DC, bottle did not taste youthful solely from topping off. That the Bordeaux-shaped bottles taste different then the Burgundy-shape bottles is acceptable. But the extreme youth of the wine coupled with the fact that both type of bottlings have the exact same label makes me suspicious. On a positive note, if you have purchased one of these recently waxed Bordeaux-shaped bottles you probably will not be disappointed. Our bottle was a big hit, which is saying something because the New York City bottle was the worst of all the Madeiras we tasted that day. 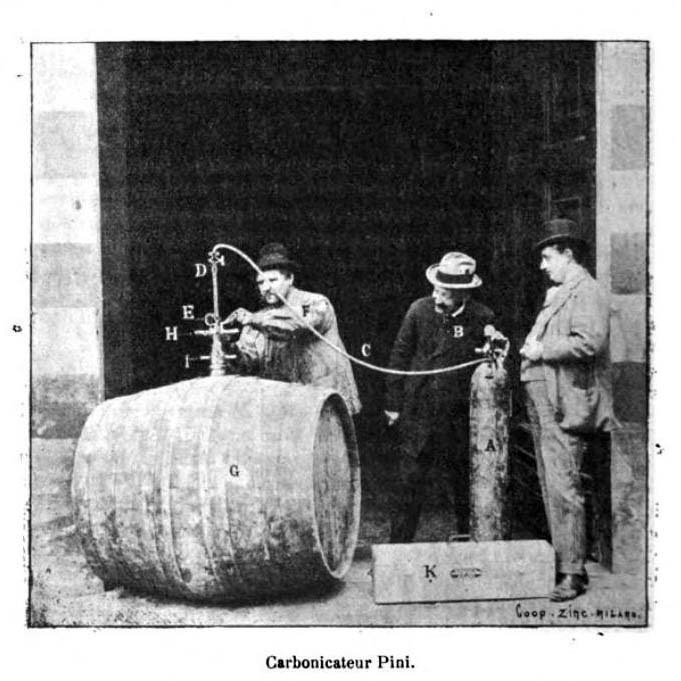 The Carbonicateur Pini debuted in 1898 as a device designed to preserve wine in barrel through carbonation. It was felt that young wine, which still had carbonation, was attractive due to its pungency. As the carbonation faded, the wine came across as flat and stale as it was exposed to more oxygen. It was felt the pumping the wine full of carbonation could fend off oxygen contact. Research and meetings about the use of carbonation appear to have gained favor during the second half of the 19th century. The Carbonicateur Pini is a 30 kilogram device that allows the user to carbonate barrels of various sizes at the rate of 100 hectoliters per day. It uses a tube and metal pipes with tiny holes to inject the gas into the wine. The pressure of the barrel may be regulated. The inventor hoped it would gain popularity in southern France and Algeria. It was even felt that it could improve wine. 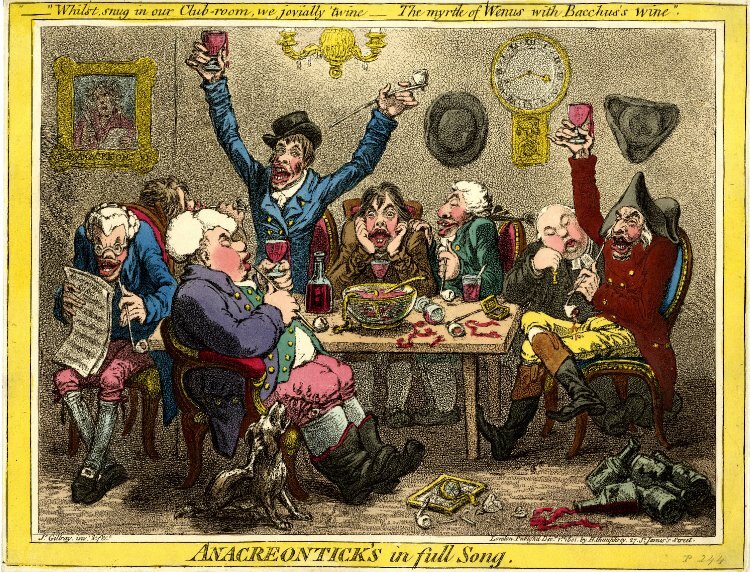 Printed 7 or 8 years after the Great Comet of 1811, this image showing a happy cobbler holding up a jug of wine. Above the doorframe appears the image of a comet with the letters “LA COM” underneath it. 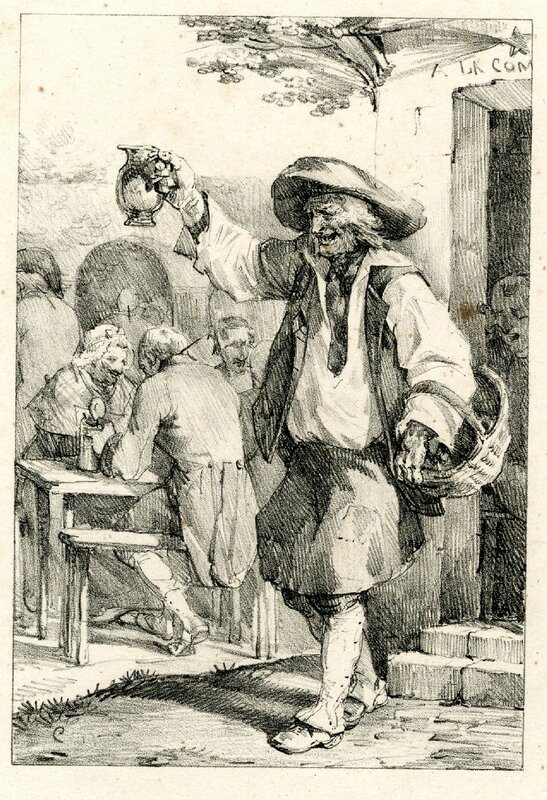 Perhaps the cobbler is smiling because he is drinking wine from the 1811 harvest. A vintage which Michael Broadbent once rated five stars for the wines of Sauternes. Le vin de la comet. Print by Nicolas Toussaint Charlet. Printd by Delpech. 1818-1819. #1875,0612.116. The British Museum. In maintaining focus on the vintage of 1811, the year of the Great Comet, I have decided to post this great satire illustration. It depicts the head of the comet as containing a “comet cake” with decanters of wine and glasses on top, followed by a tail of wine decanters, wine glasses, a bottle screw, fruit, and perhaps a punch bowl. Even the colors are fantastic! 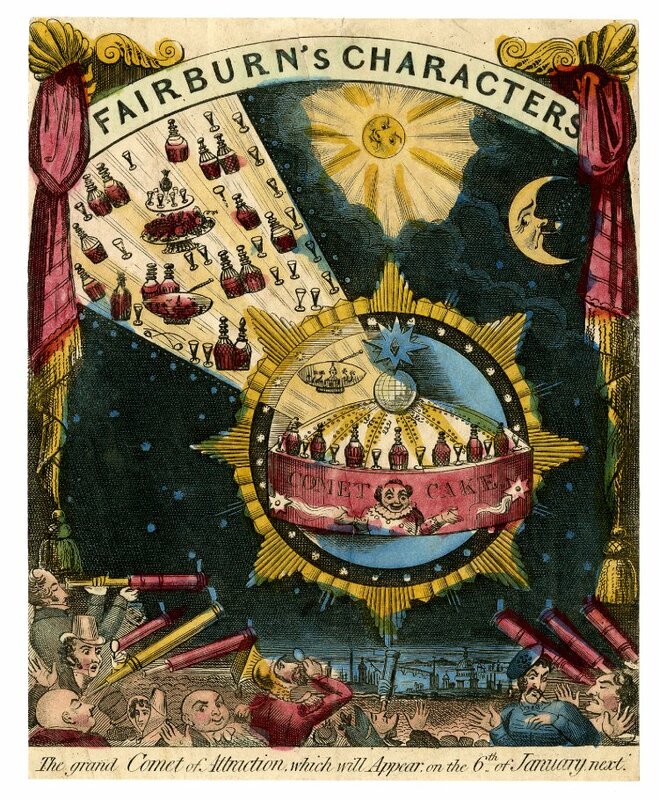 Fairburn’s Characters. c 1811. Published by John Fairburn. #1991,0126.6. The British Museum. Last week started off strong as I attended A Blast from the Past: Madeira Extravaganza in DC which celebrated 20 years of collaboration between Mannie Berk (Rare Wine Co.) and Ricardo Freitas (Vinhos Barbeito). The week ended in Philadelphia where I gave a talk about Henry Hill and Madeira. It turns out that the week was steeped not only in old Madeira but also in old red wine. There was a Madeira from the famous 1811 Comet Vintage and a red Burgundy from the 1945 Victory Vintage. These important vintages were drunk with dinner at Ripple. Present were Mannie, Ricardo, Darryl, Nancy, Tim, Lou, Kevin, and myself. Many thanks to Marjorie Meek-Bradley for sending out plates of lovely food and Danny Fisher for taking care of us. To be presented with any glass of wine from the Comet Vintage is a treat. Even some fifty years after the harvest, John Timbs wrote in 1862, “Who has not heard of the comet wine of 1811?” Just over a decade later Charles Hindley defined “comet wine” as one “of superior quality”. He noted that this was perhaps “because the comets themselves exercise some chemical influence on them.” Henry Vizetelly wrote about this vintage a few times, describing it as “famous” and “grand”. I was, admittedly, infected with historic excitement. Bemused why no one at the table was discussing comets, you can only imagine my great laugh when Mannie suggested all of the people who cared about Comet Wines had long since passed away. Indeed, I bear no resemblance to the following satire illustrating the type of men who might have cared about it. The sort of people who cared about the Comet Vintage. Anacreontick’s in full Song. Gilroy, James. 1801. #1868,0808.6974. The British Museum. Comets aside, the 1945 vintage was on everyone’s minds with the difficulties in the vineyards and of producing the wine. But first we drank Champagne as everyone arrived. There was discussion of flawed state of the Champagnes. 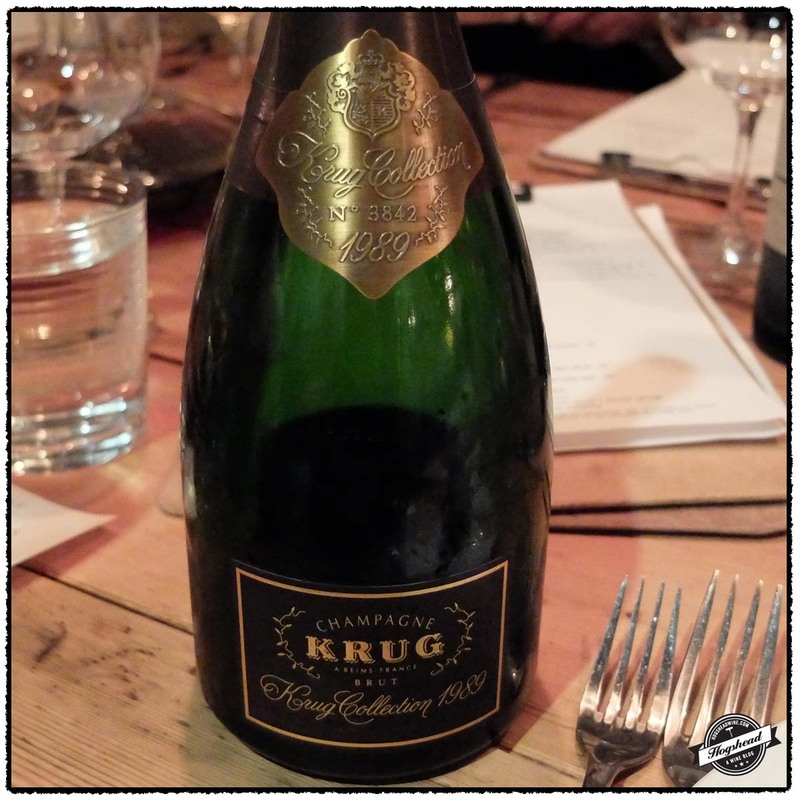 I did not mind too much, though I found the 1989 Krug Champagne Vintage Brut Collection too aggressive. 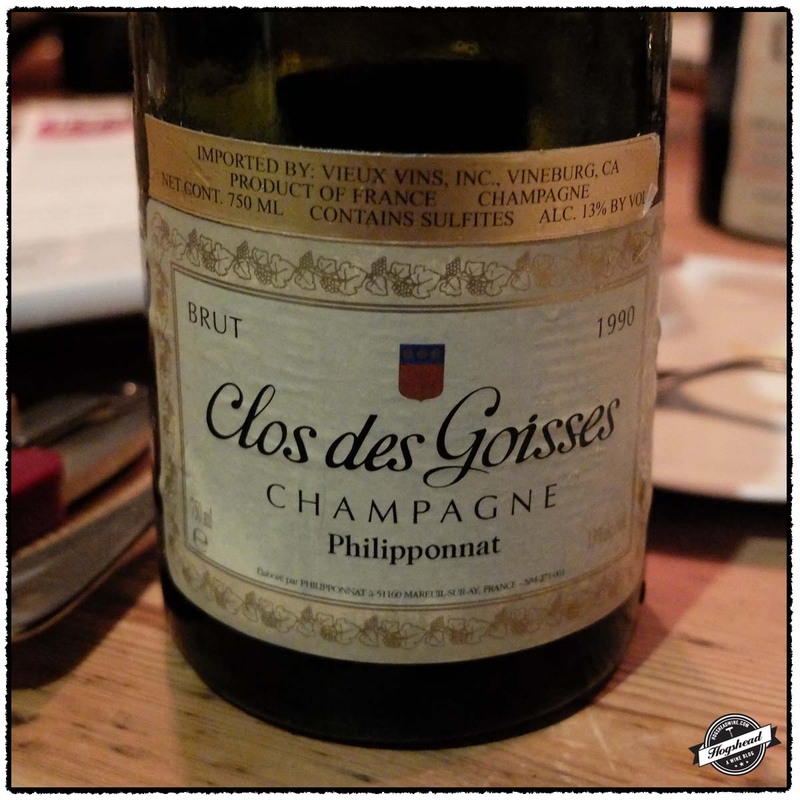 The 1990 Philipponnat, Champagne Brut Clos des Goisses had a rather short finish, the mousse was soft and it reminded me of an old wine. I enjoyed it. There was no disagreement about the sole white wine. 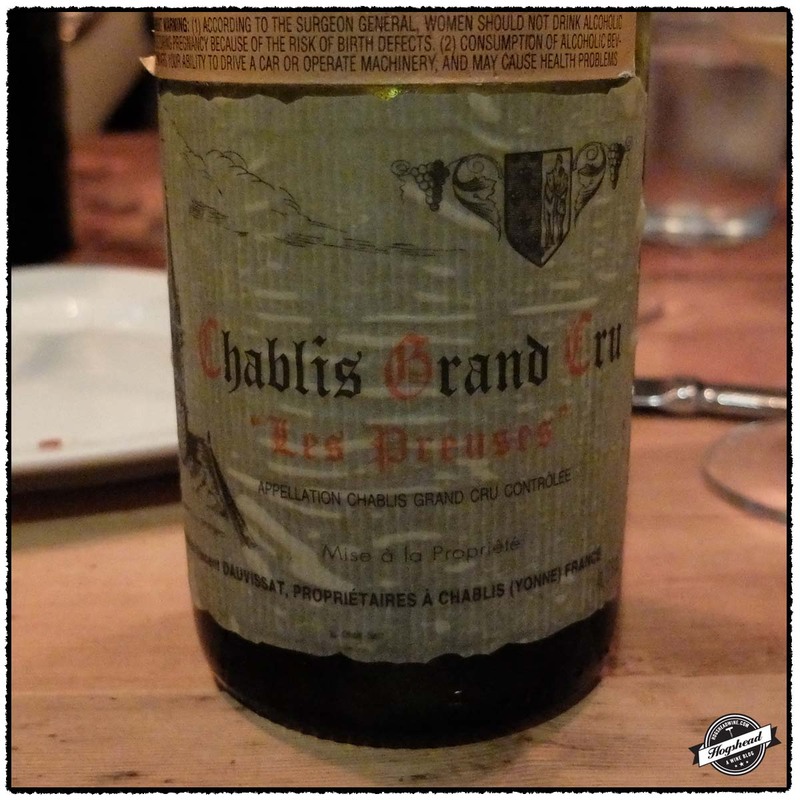 Simply put, the 2000 Vincent Dauvissat (René & Vincent), Chablis Grand Cru Les Preuses was electric! The yeasty, deep nose made way to good bubbles that burst from aggression in the mouth. The wine was minerally with a little creamy spiced flavor. The flavors themselves were mature. *** Now – 2025. Imported by Vieux Vins. Disgorged February 2001. Alcohol 13%. I found a beautiful core of fruit then apple orchard hints. The fruit is ripe and texture with smaller, gentler bubbles bringing it forward. The flavors leaned towards that of a mature still wine mixed with baking spices. No doubt good to drink but the shorter finish is obvious. ***(*) Now – 2020. Imported by Vieux Vins. Alcohol 13%. The yeasty, electric nose of yellow fruit prepared the palate for the young and lovely flavors in the mouth. The wine showed more fruit both with air and with food. There was a very focused, gentle weight, and an attractive hint of cream and note. Note quite saline. Certainly lovely. **** Now – 2025. 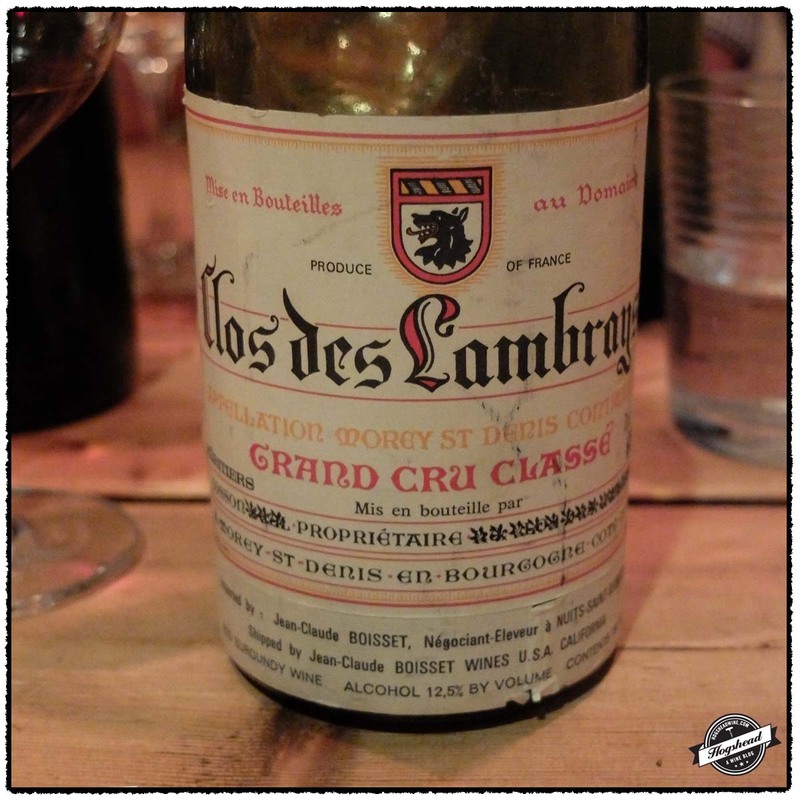 Though Clos de Lambrays is a centuries old estate my particular interest is that of the past century when the estate, under the Rodier family, went into decline after the First World War. Fortunately, Albert Rodier had a wealthy mistress, Renee Cosson who acquired the estate in 1938. The Appellation Controlee in Burgundy had just been established a few years earlier in 1936. The vineyards of Clos de Tart, Clos de la Roche, Clos Saint-Denis, and even Bonnes Mares were classified as the finest. Despite Clos de Lambrays being surrounded by these Grand Cru vineyards, the Cosson’s never pursued this designation potentially due to taxes, according to Clive Coates. It is commonly reported that as the old pre-phylloxera vines died off they were never replaced and the soils were not composted. Chaptalization was never allowed and the wine spent a very long time on the skins. The 1945 vintage in Burgundy saw a severe frost on May 1st which significantly reduced the potential crop size. A cyclone hit in late June further reducing potential size to one-sixteenth of what was anticipated. Thus the hot weather combined with a tiny number of grapes resulted in very concentrated wines. 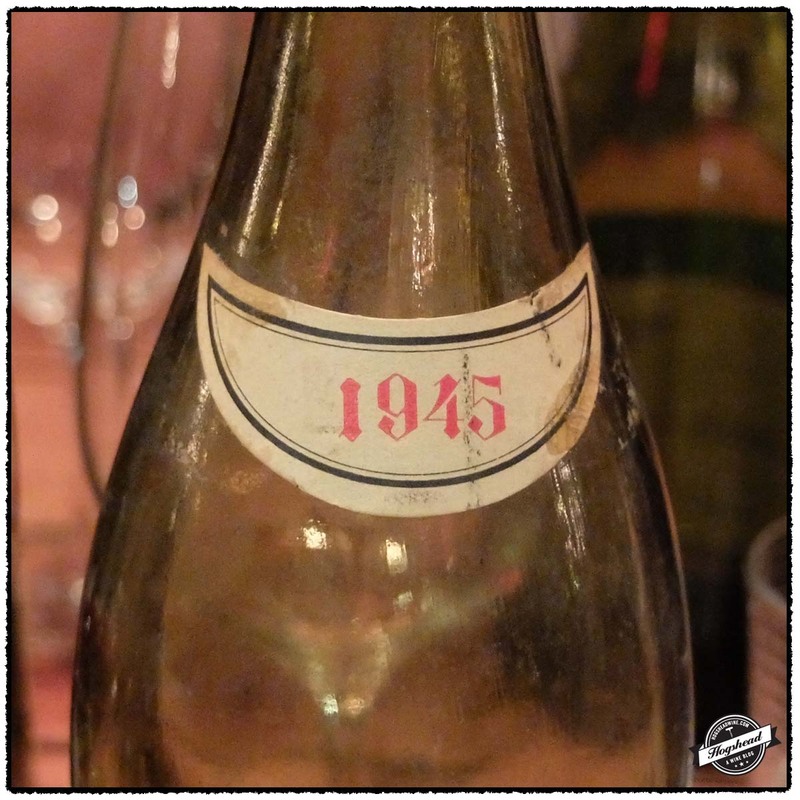 Indeed, our bottle of 1945 Domaine des Lambrays, Clos des Lambrays lived up to the historic hype clearly reflecting the “traditional manner” of production as described by Alexis Lichine. The wine smelled unique and in the mouth were old-school flavors that still contained fruit with a seamless, minerally, weighty nature. The wine drank great for about one hour after it started to fade by drying up. There is no doubt in my mind that well stored examples will drink well for many years to come. The label for the wine is quite attractive and was designed a friend of the Cosson family, the Alsacian Hansi. If you examine the label, it previously stated “Cosson Seul Proprietaire de Clos des Lambrays”. Subsequent to the printing of the label the words “Seul” and “Proprietaire de Clos des Lambrays” was over struck. The word “Heretiers” was added above “Cosson”. In the 1960s, Robert Cosson took over the operations from his mother Renee Cosson. Alexis Lichine writes that he sold wine to shippers. This makes sense because this bottle was shipped by Jean-Claude Boisset who formed his Negociant company in 1961. Perhaps reflecting his new management status Robert Cosson felt “Heretiers Cosson” was only appropriate given that he was heir to the estate. I have made a few enquiries and will update this post with anything I hear back. Shipped by Jean-Claude Boisset Wines USA.. Imported by Jean-Claude Boisset. Alcohol 12.5%. There is a unique, attractive nose with dark soil notes and a hint of band-aid. In the mouth a significant amount of fruit still exists with a minerally, weighty nature. The tannins are nearly resolved with the acidity bound in a seamless package. There is great balance and plenty of concentration and power for future life. With air the wine took on a sweaty, pungent nature with old-school flavors, and an attractive hint of saline and soil. Clearly unique. After one hour the flavors became drier but then my glass was emptied. ****(*) Now – 2025+. Three red Bordeaux comprised our red wine flight. Kevin decanted the 1953 Chateau Latour, Pauillac whereas I simply opened the other two bottles. 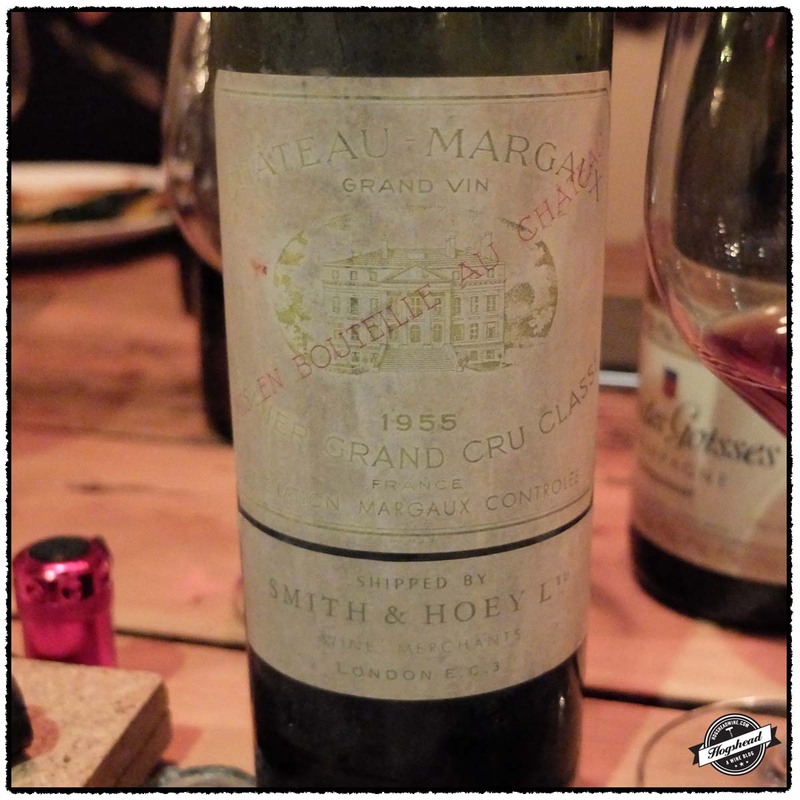 The cork of the 1955 Chateau Margaux, Margaux was in good shape, only slightly soft, and came out in one piece with the help of my Durand. The top of the cork was branded with two overlayed T’s. I meant to check the body of the cork but forgot and left it on the table. 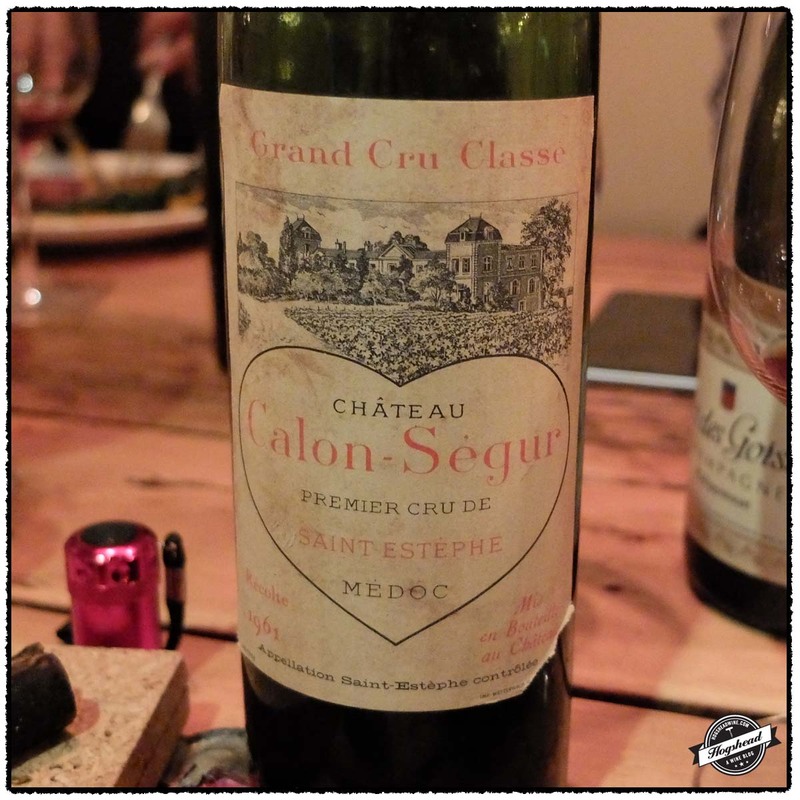 Though the cork of the 1961 Chateau Calon-Segur, St. Estèphe came out in one piece, it was coated on the top and indeed all the way along the sides with a dusty, moldy smelling layer. Hence the low-shoulder fill. The cork did not smell right and one whiff of the wine confirmed it was past drinking. As Mannie noted, it was the darkest wine of the trio, which to him, indicated oxidation. That left us two chateau-bottled wines both produced by traditional methods. Whereas the Chateau Latour represents a style of management and winemaking that had been in place for decades, the Chateau Margaux represents efforts to return the estate, vineyard, land, and chateau back to form. Chateau Latour was owned by shareholders with the estate administered by a Societe Civile since the 19th century. Incredibly the Phylloxera arrived late. The first vines only replanted onto American rootstock around 1901 with the entire vineyard completed in the 1920s. The 1950s eventually saw a doubling of yields over the previous decade. The fruit was destalked by hand then was fermented in oak vats. Les Forts de Latour would not exist for another decade until the 68 shareholders sold off a majority of their stakes. In wasn’t until this ownership changed in 1962 that the modern tools of mechanical destalking, stainless steel vats, and temperature control were introduced. Even the vineyards were extensively expanded. The Ginestet family had completed purchasing shares of Chateau Margaux so that Pierre Ginestet became sole proprietor in 1940s. Under the Ginestets the sprawling vineyards were reduced to just the best terroirs and there was a return to selecting the best vats of wine for the grand vin. Like Chateau Haut-Brion, Chateau Margaux had mandated chateau-bottling in the 1920s but this was abandoned from 1930 through 1949 when shipping in wood was allowed. The Ginestets were able to restore chateau bottling as well as the chateau itself. There is no doubt in my mind, nor was there in my palate, that the flight of Bordeaux could match the 1945 Clos des Lambrays for aroma, depth, and length. It was, harshly put, an obvious step down in quality. I write that not to belittle the Bordeaux but to show the clarity with which the 1945 Clos des Lambrays stood out. 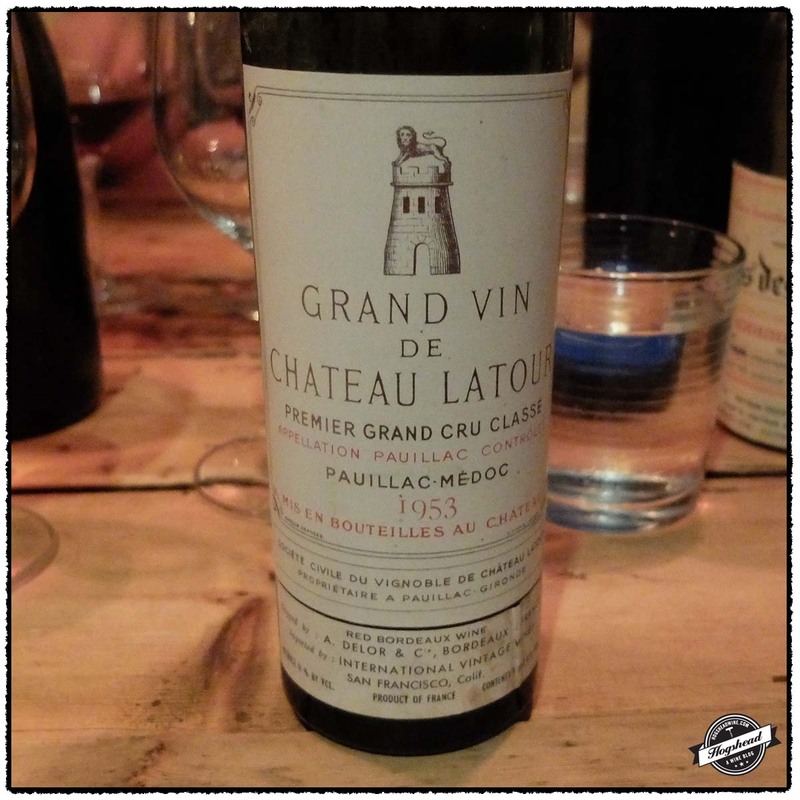 The 1953 Château Latour Grand Vin, Pauillac received decanting but to me it maintained a sort of grip on its flavor. I kept expecting it to reveal more but it never did. Still, it was enjoying and particularly fun because it offered a strong contrast to the Margaux. If the Latour offered a more powerful, stand-up profile the 1955 Château Margaux, Margaux was all about fruit with a delicate, gentle nature. On this night it was a wine to drink and be seduced by. Shipped by A. Delor & Co. Imported by International Vintage. Alcohol 13%. Consigned from a private collection to Edward Roberts International. 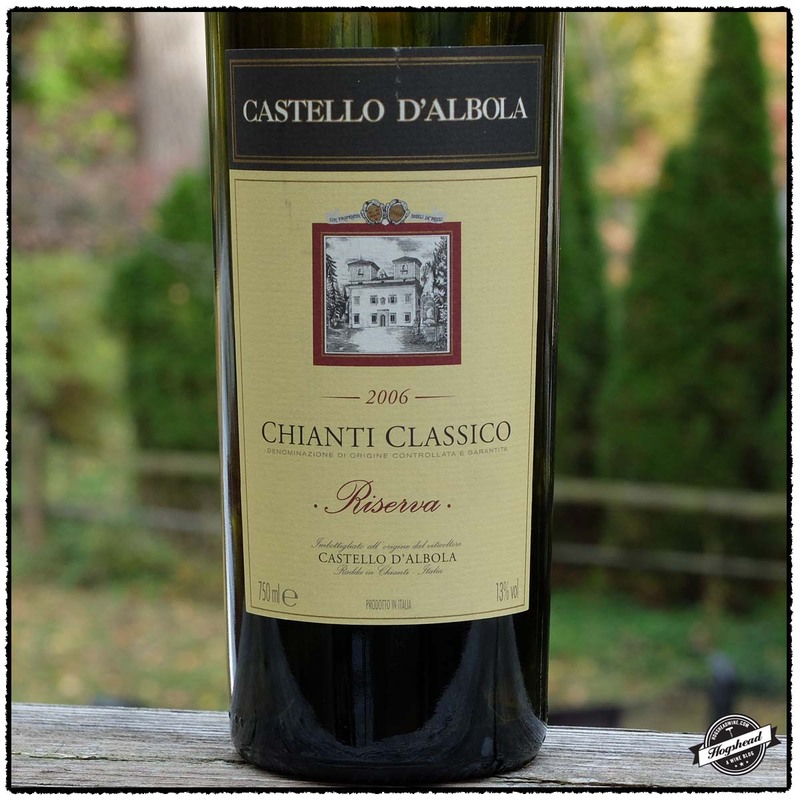 The iron-like flavors maintained a focus that matched the core of red-black fruit hints and good acidity. The flavors maintained their binding in the structure and I found them particularly interesting n the middle with notes of old, dry leather, iron, and old wood. Will clearly last but will not offer anything in addition. ***(*) Now – 2020. Shipped by Smith & Hoey Ltd. Unknown importer. Mid-shoulder fill. There were lively, green hints in the mouth. Some structure came out on the teeth but the seductive, sweet, old fruit match it well and built intensity towards the finish. It is a pretty wine that took on a touch of weight. The delicate red fruit **** Now. Unknown shipper and importer. Bottom shoulder fill. Clearly tired on the nose but I gave it a go anyways. The aromas of mushrooms made way to firm flavors with roast notes and an old mushroom note. Dying. 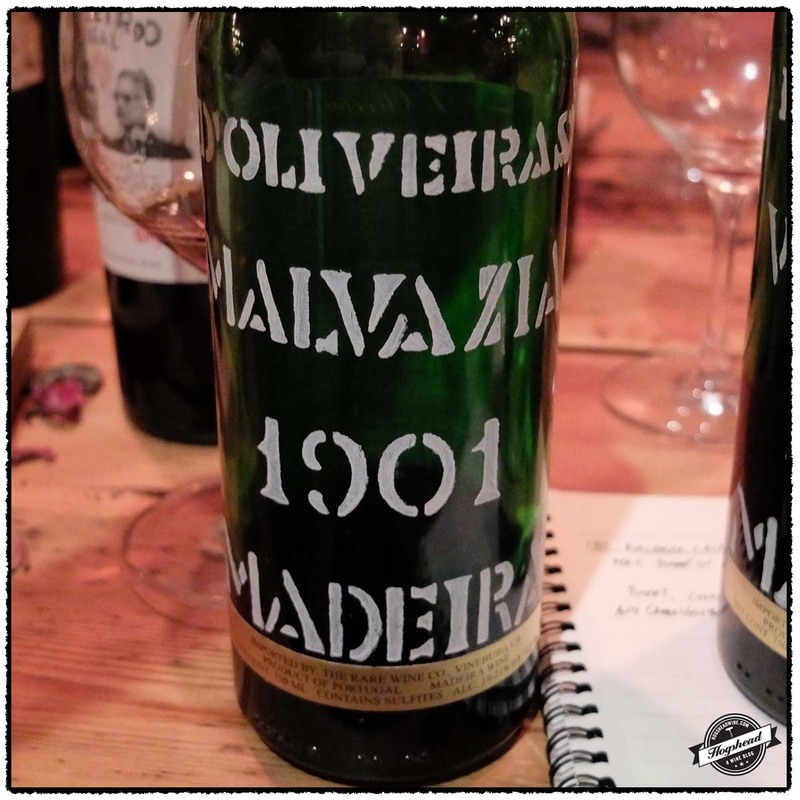 I first tasted an 1811 Malvasia Candida wine earlier this year in New York City which you may read about in the post “[W]hen of the best kind, a most delicious wine.” An historic 19th century Malvasia Madeira tasting. In all honesty, the bottle from NYC proved the worst experience of the evening. This did not deter my excitement to try the wine again for there was a difference. 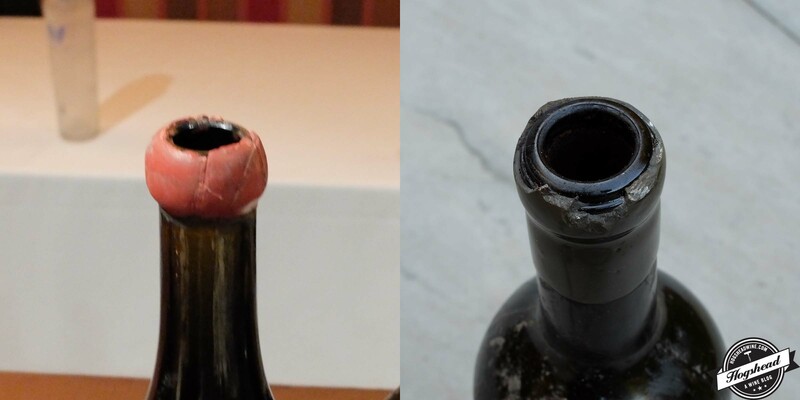 The previous experience came from a Burgundy shaped bottle sealed with red wax. For this dinner the bottle bore the same label but the glass was Bordeaux shaped and the wax was a dark, military gray. I had reasonably assumed, that when the 1811 was bottled the Burgundy bottles ran out so whatever else was on hand, Bordeaux bottles in this case, were then used. Or vice versa. That the wax was different implied two separate bottlings. However, from the very first sniff I knew this was a different wine and in no way related. In addition, it was way too young. Just the night before I drank the 1866 and 1837 Barbeito Bual with perfect provenance through Mannie from Ricardo. 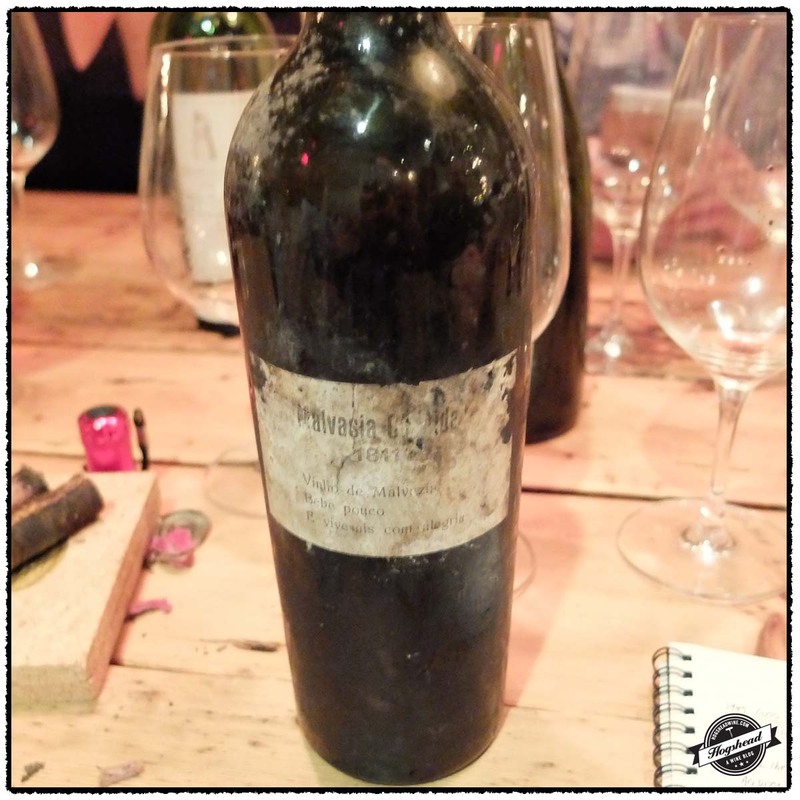 This particular bottle of 1811 tasted even younger! I will write a follow up post focusing in on this particular bottle in detail. There were other Madeira’s that night as well. It was getting late so my notes are short. The 1901 D’Oliveiras, Malvasia, Madeira was less sweet and showed an attractive nutty profile. 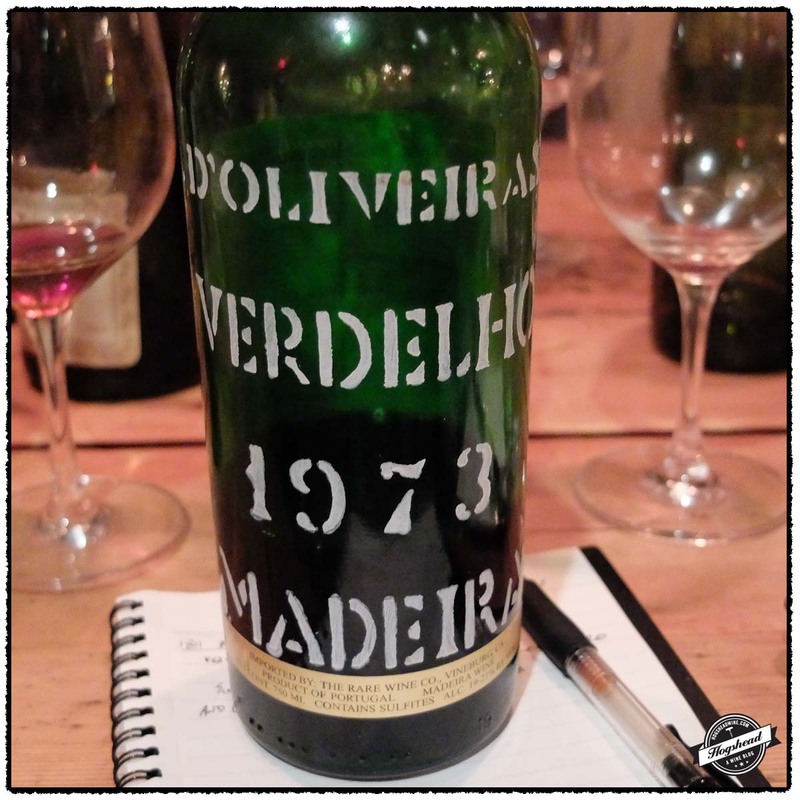 The 1973 D’Oliveiras, Verdelho, Madeira was rich, racy, and pungent. All aspects that I really like. This is a young wine to consume in the future. Acquired from a private collection Acker Merrall & Condit auction May 21st, 2015, New York. This was very sweet on the nose and with air, a prominent thyme note came out. In the mouth this wine was sweet, concentrated, vibrant, with a hint of Big Red flavors and a bit of greenhouse. There was sweet sugar and lots of thyme flavors. Way too young to be an 1811 and of the wrong flavor profile. Nevertheless, whatever was in the bottle, provided a tasty experience. Not Rated. Imported by Vieux Vins. Alcohol 19%-21%. There was a musky nose with nut flavors in the mouth, acidity on the sides of the tongue, and good liveness. It had an oxidized note in the long finish. **** Now – 2090. Imported by Vieux Vins. Alcohol 19%-21%. This was rich and racy with fine power and structure. The pungent flavors mixed with orange peel before the powerful and dry finish. The wine returns again with strength. Young! **** Now – 2115.